Well here we are again, fall and the end of the racing season as we know it and the beginning of, or at least the middle of specials season. If you take away the bad weather it seemed like a pretty good racing season was had in spite of the sour economy here in Michigan. Most of the tracks I visited had decent fan counts at least the nights that I was there. I got to see a ton of racing at a variety of different tracks from ¼ mile D-ovals in Canada to a few half miles, ¼ miles, 1/3 and 3/8 mile tracks both dirt and asphalt. As I look back over the season all I can say is that I had a blast and Thank You to all of our member tracks for having us out for a night at the races and Thank you to all of our members who showed up at all these great tracks and supported the club. You both are two of the reasons this sport is so great and one that I love. It’s been a tough year as well for many families who have lost loved ones. Long time member Rick Kilbourn lost his brother Dave Kilbourn, Dave was active in the vintage racing scene and owned a replica of the famous Howe racing Green Hornet Camaro complete with G0ing on one side and G0ne on the other. Hartford speedway safety worker Harold Curtis lost his life as the result of an accident and Former Toledo speedway owner and Mt. Clemens race Track Promoter Sonny Adams passed away as well as most recently, club member, “Big Mike” Wilhite left us all too soon. 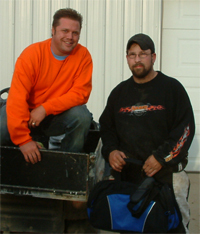 Mike was the Crew Chief for Auto city Super Stock driver Terry Bogusz Jr. This team also lost Jim Efaw earlier this year. Jim was a longtime crew member and a MARFC member as well. On top of all that former President “Wild Bill” Barnhart lost his mother. I send my, as well as the club’s condolences to all of these families. As we move into fall we also move into our monthly meetings. Mark your calendars for Saturday, October 17th at 6 PM as we will be at the Kart 2 Kart indoor karting facility for a meeting. Not only will there be guest speakers but we will draw for our winners in the annual raffle ticket sale. By the way, please get your ticket stubs and money in to Sue Ginter. I apologize for the late update to the website. It has been a very busy month for the club and for myself and getting this information ready. I will leave it up a bit longer so everyone can enjoy it. July 31st saw the club head west to the Winston Speedway for the first time ever at this fast 1/3 mile dirt track located in Rothbury. The racing was excellent with the outlaw Late Models and all of the regular divisions that Winston has to offer. Our Helmet bag was presented to Modified Driver Mike Petersen who races the #3 Modified. Door prize winners were the Town family, Stan, Howard, and Mary. A big Thank You and a warm welcome to the club goes to Tom & Lois Sprague Sr. as it is truly great to add this facility to the MARFC Family of tracks. Announcer Andy O’Riley gave us some good plugs and I ran into former board member Tom DeVette while there. We look forward to 2010 and a repeat visit to Winston. August 7th took the club up to the U.P. and the Kinross Speed Park. Bill and Linda Walters made the trip to represent the club and were able to hand out the Helmet Bag to John Clancy, driver of the #28 Pure Stock and our raffle winner was Charles Berles. Thank you to Gerry Liscumb Jr. and the Sault Area Racing Association for having us out to the races. Thank You to Bill and Linda Walters for taking the trip to Kinross Speedpark. August 14th saw the club have a day to roam around the Michigan International Speedway for qualifying and practice days when MARFC was the guests of MIS for the day. Club members were treated to qualifying and practice for both the Nationwide and Sprint Cup Series. Thank You to Dennis Worden, P.R. Director for the Speedway and the rest of the staff for having us out to this major league facility. August 22nd took the club over to the I-96 speedway for some more dirt racing action. Al and Kyle Peltier went over to the rain shortened evening. 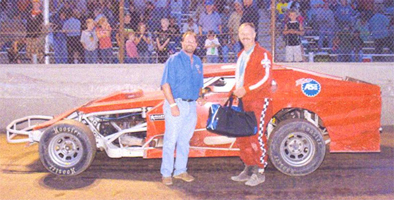 I-96 bag winner was Late Model driver,Jimmy Fairbanks Jr. for his dedication to the sport. He broke his arm in a wreck earlier in the season and put somebody else in the car while he recovered so the car would be there and support the track. Table helpers were Al and Kyle Peltier. Thanks to Al & Kyle for heading to I-96 and Thank you to Mike Mouch and the staff at the I-96 Speedway for having the club out to the races. The pictures tell it all, a great time was had by all and a big Thank You to club members Jeff Moroni, Larry Iacoboni, Laura Tucker, Sue Ginter, Steve and Cory Russell, and yours truly who battled the rain on the Wednesday before hand to get a coat of MARFC blue laid down on the beast. Unfortunately, Mother Nature didn’t cooperate so well and some of our bus turned yellow again after we left. When we got to the track we witnessed the spray can art of Jason Sanderson who lettered up the beast for us. Jason did a great job as the pictures. Unfortunately, early mechanical woes took our driver and longtime club member Jack Franzil out of contention and a survivor of the carnage. Thanks to Jack Lecot, Norma Kas, Michigan Legends, and Performance Images who donated supplies or helped to sponsor the bus. We had fun and thanks to Scott Schultz and Ron Drager for letting us play. While not an official Fan Club day, our friends at the Toledo Speedway are offering all 2009 MARFC members $5.00 off on general admission for the Glass City 200. Not only will you see the historic and prestigious 200 lap Super Late Model Race, you will also see a full program of Toledo Sportsman and the Auto Value/Bumper to Bumper Michigan Legends Series. An early Thank you to Ron Drager, Roy Mott, Scott Schultz and the staff of Toledo Speedway.